I don’t know what your relationship with your mother is, but I am pretty sure it is a complicate one, which is why I will not talk about your mother or mine today. Yet from the perspective of time and space (I live thousand of kilometres away from mine :(, I believe mothers are absolutely awesome and most of the time they do know best! So when my mom used to help me pack for my first parent-free holidays to the Black sea, she would sneak into my suitcase an extra sunscreen spray and talk to me for hours about the damage of the sun on the skin. Of course who would care about the sun and ageing when you are 20…but now I don’t think of it as nonsense any more. So I decided to nail the topic about summer skin care and ask the real experts what to do to protect your skin not just from the sun, but from the free radical activity and the appearance of discoloration and skin ageing. My personal experience and advice as a skin beauty junkie: For years now one of my “secrets” for smooth and even tan in summer is using Vit C topically. I usually do a course of Vit C concentrate for several weeks, then take a break and would do another one end of summer. What you may not know about Vit C is that it helps protect your skin from oxidative stress caused by free radicals, it also helps the development of the healthy collagen and keeps the moisture of the skin at a good level. With a targeted vitamin C cure and a coordinated care routine, skin irritations, sun damage and red spots can be reduced. Personally I find my skin become really smooth and with a fresh tan, without any dull moments (and without breakouts, since I have a mixed to oily skin). I really love my Vit C, but there is a special rule about using vit C concentrate. The problem with these acid types of Vitamin C is that they are highly unstable. Every time you open the bottle, oxygen gets into the product and begins to break it down. If your Vitamin C serum starts to turn brown half way through the bottle, that’s a sign that it is oxidizing and is losing its effectiveness. (Think of an apple that turns brown 20 minutes after taking a bite.) This is why the tiny bottles I use last only a week in the fridge and the Vit C is in a powdered form. It is kept in a small container, which is placed in a top container and you have to press to release in the liquid and dissolve. After using this little bottle, take the next one and dissolve the same way. Find out more about Vit C in summer here. As you see we live in a time when there are so many products out there promising to solve any kind of problem with our skin, but skin science is not as easy as we might think. So better consult the experts. 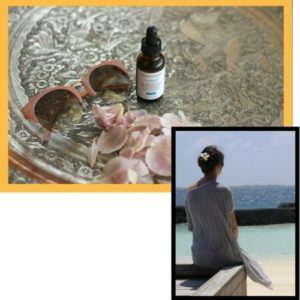 Today I am asking one of the most popular Swiss Beauty bloggers “I am a Beauty Junkie” about her top tips for keeping a healthy and glowing skin in summer. Lilia Bassi is also the founder and CEO of Age-Stop, a Premium Swiss Skin Care brand with one main mission: The Science of Staying Young! 1. Drink lots of water. During summer your body sweats more. So in order to keep your body hydrated during these days drink as much liquid as possible. Always carry a water bottle with you and keep drinking lots of water throughout the day. 2. Use sunscreen, always. To keep your skin protected from the harmful UV rays use a sunscreen lotion or spray generously all over your body. Make sure you apply it 20 minutes prior to stepping out in the sun. Also on cloudy days. 3. Protect your lips. You will notice that your lips will become dry very often in summer just like the winters. So make sure that you not only keep your skin moisturized but also apply a nourishing SPF enhanced lip balm on your lips regularly to keep them moisturized. 4. Protect your hands. If you use hand cream to keep your hands soft and supple, opt for one with a broad SPF since our hands tend to get tanned the most during summer. It will not only keep your hands moisturized but will also protect them from sun damage. 5. 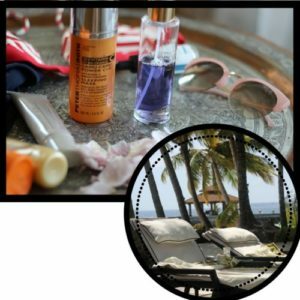 Use beauty products that contain SPF. Whether you use a moisturiser or compact powder throughout the day, make sure that it contains SPF (Sun protection factor). 6. Wear a hat while traveling. Opt for a wide-brim hat for traveling time to keep the sun rays off from your face. Not only will it keep the sun off from your face and head but it will also be your stylish accessory for your summer outings. 7. Go heavy on the Conditioner. Sun, sand, saltwater, and chlorine can wreak havoc on the hair (especially if it’s colored! ), so get ready by making sure that you are deep conditioning at least once per week. This will help to strengthen hair, restore hydration, add moisture, enhance shine, smooth hair, prevent breakage, and cut down on frizz. 9. Ban the bumps, stubble, and ingrown hairs. Exfoliate. Show off smooth, bump-free skin all summer long by exfoliating first before shaving in the shower. This will help to pick up the dead skin cells that hinder you from getting a closer shave as well as prevent ingrown hairs that could lead to razor bumps. Then, use an oil all over skin while it’s still damp to lock in moisture. 11. Freshen up with Toner/Essence Sprays with hydrating plant extracts and hyaluronic acid. Throughout the day we collect and spread bacteria all over our face, but even more so in the summer months when sweat traps that bacteria. So make sure to freshen up regularly. 12. TAKE A COLD SHOWER. Hot showers after sun exposure further dry skin-turn down the temperature and you’ll pick up a few added benefits. A cool shower after excess sweating helps keep the skin free from breakouts.